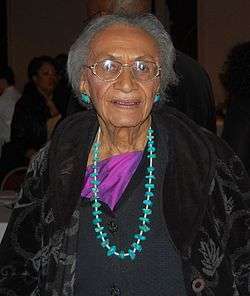 Frankie Muse Freeman (born Marie Frankie Muse, November 24, 1916 in Danville, Virginia) is an American civil rights attorney, and the first woman to be appointed to the United States Commission on Civil Rights (1964 to 1979), a federal fact-finding body that investigates complaints alleging discrimination. Freeman was instrumental in creating the Citizens' Commission on Civil Rights founded in 1982. She has been a practising attorney in state and federal courts for nearly sixty years. In 2007, Freeman was inducted in the International Civil Rights Walk of Fame at the Martin Luther King, Jr. National Historic Site, Atlanta, Georgia, for her leadership role in the Civil Rights Movement. On Thursday, February 5, 2015, President Barack Obama appointed Freeman to serve as a Member of the Commission on Presidential Scholars. Born to William Brown Muse and Maude Beatrice Smith Muse, Frankie came from a college-educated family. She grew up in Danville, Virginia where she attended Westmoreland School and learned to play the piano. At age sixteen, Muse enrolled in her mother's alma mater, Hampton Institute, which she attended between 1933 and 1936. In 1944, she was admitted to Howard University Law School and received a law degree in 1947. While a student at Howard Law, Freeman became a member of Epsilon Sigma Iota sorority, the first American legal sorority for women of color. In 1948, after writing to several law firms and not hearing back from them, Muse decided to establish her own private practice. She began her practice with pro bono, divorce and criminal cases. After two years, Freeman began her work in civil rights when she became legal counsel to the NAACP legal team that filed suit against the St. Louis Board of Education in 1949. In 1954, Freeman was the lead attorney for the landmark NAACP case Davis et al. v. the St. Louis Housing Authority, which ended legal racial discrimination in public housing with the city. Settling in St. Louis, Freeman worked as staff attorney for the St. Louis Land Clearance and Housing Authorities from 1956 until 1970, first as associate general counsel and later as general counsel of the St. Louis Housing Authority. In March 1964, she was nominated by President Lyndon Johnson as a member of the United States Commission on Civil Rights. On September 15, 1964, the Senate approved Freeman’s nomination and she was officially appointed as the first black woman on the civil rights commission. Freeman was subsequently reappointed by presidents Richard Nixon, Gerald Ford and Jimmy Carter, and held the position until July 1979. She was appointed as Inspector General for the Community Services Administration during Jimmy Carter's Administration in 1979. A year later, the Republican Ronald Reagan was elected president and demanded the resignation of Democratic inspectors general appointed by previous presidents. Freeman returned to St. Louis, where she has practiced law ever since. In 1982, Freeman joined 15 other former high federal officials who formed a bipartisan Citizens Commission on Civil Rights, a group committed to ending racial discrimination and devising remedies that would counteract its harmful effects. At age 90, she is still practicing law with Montgomery Hollie & Associates, L.L.C. in St. Louis, a three-attorney firm. She has numerous volunteer activities, such as adult Sunday school classes at Washington Tabernacle Missionary Baptist Church. She is on the board of the World Affairs Councils of America, St. Louis, with the mission to promote understanding, engagement, relationships, and leadership in world affairs. In 2003, she published her memoir, A Song of Faith and Hope. She is past national president of Delta Sigma Theta Sorority Incorporated. She turned 100 in November 2016. Freeman is a Trustee Emeritus of the Board of Trustees of Howard University, past Chairman of the Board of Directors of the National Council on Aging, Inc. and the National Urban League of Metropolitan St. Louis. She is also a board member of the United Way of Greater St. Louis, the Metropolitan Zoological Park and Museum District, and the St. Louis Center for International Relations. Freeman has received honorary doctorate degrees from institutions including Hampton University, University of Missouri–St. Louis, Saint Louis University, Washington University in St. Louis and Howard University. 1990, she was inducted into the National Bar Association's Hall of Fame. 2011, she received the Spingarn Medal of the NAACP. 2014, Spirit of Excellence Award from the American Bar Association Commission on Racial and Ethnic Diversity in the Profession. ↑ Staff (2016-10-23). "St. Louis civil rights attorney Frankie Freeman celebrates her 100th birthday". St. Louis Post-Dispatch. Retrieved 2016-11-27.